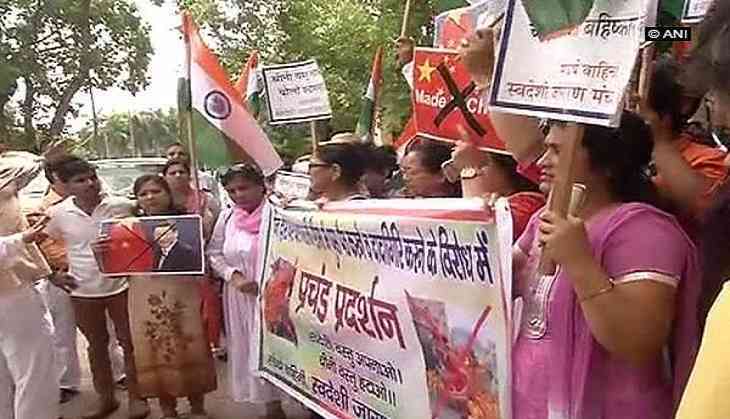 In the wake of China stopping Indian pilgrims from visiting Kailash Mansarovar, a protest was held outside the Chinese embassy here on Tuesday. The protestors urged the public to ban China and its products. Vikas Chowdhury, a protester, told ANI, "We have organised the protest against the Chinese action of stopping India's Mansarovar visit and killing of Indian soldiers. It would be better if China stops committing these mistakes to prove that they are a superpower." Chowdhury said India's youth alone can handle China's aggression. "Our country has the capability to lead the world. The Indian youth can achieve a lot. We want to warn China, if the youth of this country, decides to achieve something, then it can easily do it," he said. While raising the slogan of "China Go Go Go", the district chief of Hindu Manch Naveen Jain condemned the Chinese move. "Prohibiting Indians from entering Mansarovar is questioning our religion and culture. We cannot tolerate this, at any cost," Jain said. Another member of the protest appealed the public to boycott 'Chinese goods' and purchase Indian goods. Last month, China refused the entry of around 50 pilgrims from travelling to Kailash Mansarovar through the Nathu-La pass.